Mums and Garters for Homecoming are one of the most exciting parts of the school year! 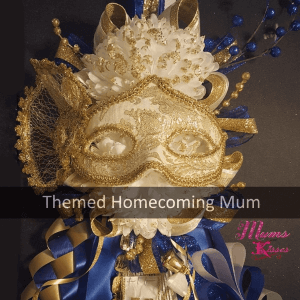 We offer several designs by our professional designers, or you can Make a Homecoming Mum with our Build Your Own Mum pages. 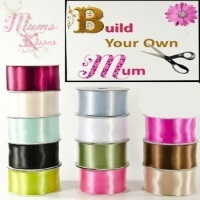 Mums and Kisses offers a luxury homecoming mum at below normal prices. 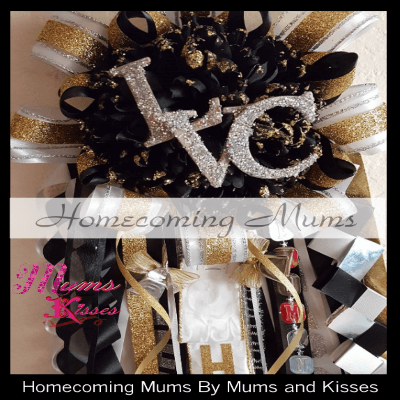 You don’t have to go broke to have a custom homecoming mum. You also don’t have to spend $200 in supplies just to get it home and spend another 4 hours putting it together. We do the work, and we’ll ship it to your door. Deal? When we first began, homecoming mums were ordered by appointment or by phone off a photo splash page. Then came social media, where mums were sold on Facebook. But we at Mums and Kisses saw things a little differently. We’re website gurus in our past lives and thought, why can’t we order a complete homecoming mum online with options? Then came websites with boxes to check and we thought, there has to be a better way. From our humble beginnings, see why we started Mums and Kisses on our About Us page, where we share how .86 cents, an over priced receipt and the grief of Alzheimer’s spurred the Homecoming phenomenon known now as Mums and Kisses. We use All Luxury ribbon, imprinted ribbon and custom cut lettering. Our mums have been featured on TV! We want you to be happy with your purchase and will walk you through every step of the way! We’re parents too and we understand those last minute arrangements and offer RUSH and URGENT ordering. “Mums are all we do so we can concentrate on you”, a motto we’ve had since the start. We’re the first to offer all satin homecoming mums and garters, online. The way they used to make ’em. But bigger! Homecoming Mums for Charity, Your Mum Purchase Helps Us Support Local and Nation Charities! It’s one of our favorite parts of making homecoming mums, giving back! We’re A Trusted Name! 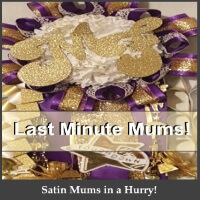 We’ve made mums for celebrities, the Dallas Cowboys and for TV News Stations and have shipped our mums all the way to Japan! Yep! The name brand products and designs we offer are 100% custom and no two mums ever looks the same, ever. That’s why we’re the fastest growing mum shop in Texas! Visit us in Store! Yes We Have a Shop To visit to Feel The Difference! Yes we sell our supplies in store! Don’t be fooled by imitators, yes we know our designs, website verbiage are now duplicated all over, but stick with the trend setters! We know what’s up! How about Custom Homecoming Mums and Garters? We make 100% Custom Homecoming Mums, all one of a kind, all double faced satin ribbons, and all from scratch! We understand that buying mums can be intimidating, especially if it’s your first time. You don’t have to worry about figuring out How to Make Homecoming Mums, we do it for you! If you’re new to the world of mums, no worries, we’ve got you covered! We also have some of the very best Senior Homecoming Mums in town! We’d love to be apart of your keepsake as well. If you don’t see what you like, then build your own and make sure it’s lit! (Yeah we’ve got teenagers too, can you tell?) Meanwhile, we’re here to help. Call us if you get stuck or if you run out of time to fill out the order choices or use our live help! Mums and Garters is all we do so we can concentrate on you! We really do want to help you get the most for your money since we’re parents too and we really do understand. We have over 25 different designs to choose from $29.95 and up. We’ll tell you on each product page how to get the most bang for your buck. We’re super transparent when it comes to our pricing. Finally, We want you to know what you’re getting. Need more convincing? We have REAL reviews from REAL customers in droves. From google to Etsy, Amazon to the Dallas Voyager Magazine, see what our customers are saying on our Reviews Page. Mums and Garters for every budget!